The subject is clearing obstacles and accumulating merit. There will also be time for question and answers. 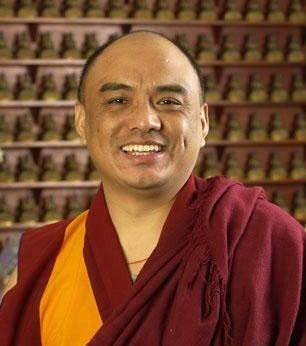 Khenpo Ten­zin Nor­gay Rin­poche was born in Bhutan in 1965. After com­plet­ing sec­ondary school in 1986, he joined Ngagyur Nyingma Insti­tute, the pres­ti­gious Bud­dhist stud­ies and research cen­ter, at Nam­drol­ing Monastery in Mysore. At the Insti­tute he stud­ied under Khenchen Pema Sherab, Khenpo Nam­drol Tser­ing and Khenchen Tse­wang Gyatso and other vis­it­ing pro­fes­sors, includ­ing Khenchen Jigme Phuntsok and Khenpo Pema Tse­wang from Tibet. He com­pleted the She­dra pro­gram in 1995 and joined the Insti­tute staff, teach­ing there for three years. He was for­mally enthroned as Khenpo by His Holi­ness Penor Rin­poche in 1998 and was assigned by His Holi­ness to teach at the Bud­dhist col­lege at Palyul monastery in Tibet. Khenpo-la received all the major empow­er­ments of the Rinchen Ter­zod, Nam Cho, Nyingthik Yab­shi and Nyingma Kama from His Holi­ness Penor Rin­poche and the Mipham Kabum from His Holi­ness Dilgo Khyentse Rin­poche. Because of his knowl­edge and expe­ri­ence, and flu­ent com­mand of the Eng­lish lan­guage, His Holi­ness Penor Rin­poche assigned him to teach stu­dents in North Amer­ica in con­junc­tion with Khenchen Tse­wang Gyatso Rinpoche.